Frederick Law Olmsted’s map of Buffalo’s park system, showing the three intersecting “parkways” and Soldiers Place. When creating their famous, city-wide system of parks for the City of Buffalo, Frederick Law Olmsted and Calvert Vaux understood the potential for residential development along the city’s northern fringes, and incorporated this understanding into their plans. As opposed to the densely populated urban blocks typical of the period, Olmsted and Vaux sought to develop residential areas adjacent to their parks that would feature wide-open spaces and landscaped grounds surrounding the individual dwellings. Therefore, the resulting plan not only created the familiar parks themselves, but also a number of “parkways” that would connect the parks while also facilitating the expected residential development. This, in turn, spawned a need to give names to the several parkways and circles which helped to connect the larger spaces. In 1869, it was decided that the approach parkways on the city’s west side would memorialize the recent Civil War, in which men and women from Buffalo had played such a prominent role. Two of the new parkways and their terminating circles would be named in honor of two officers from the city; General Daniel Bidwell and Colonel Edward Chapin. In addition, the third parkway extending to the north would be named Lincoln Parkway, in memory of the recently martyred president. The imposing, 700-foot circle formed by the intersection of these three parkways would be known as Soldiers Place—a memorial to all the men who fought for the Union cause. Thus, the new parkways and circles that made up the West Side Park Approaches honored the recently victorious Union and memorialized Buffalo’s contribution to its preservation. It has been argued that the even physical configuration of these parkways expressed the sentiment of triumphant liberty. The twin parkways that memorialized two distinguished war heroes converge on Soldiers Place, which honors all soldiers who lent their service to the cause. The third parkway, connecting Soldiers Place and Delaware Park, honors the commander-in-chief who guided them in the epic struggle. Given this context, it is arguable that the city’s park commissioners envisioned Delaware Park itself—a common green space to be enjoyed freely and equally by all citizens—as a symbol of democracy. With the turn of the 20th century and the completion of the Pan-American Exposition, the anticipated northward migration of Buffalo’s population became a reality. And the lots lining Olmsted and Vaux’s series of parkways became some of the most desirable addresses in the city. 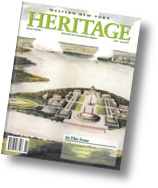 For more on the system of parkways created by Olmsted and Vaux, see the coming summer issue of Western New York Heritage magazine, due out in July. The riches of F.L. Olmsted's Humboldt Parkway before its Kensington transformation.